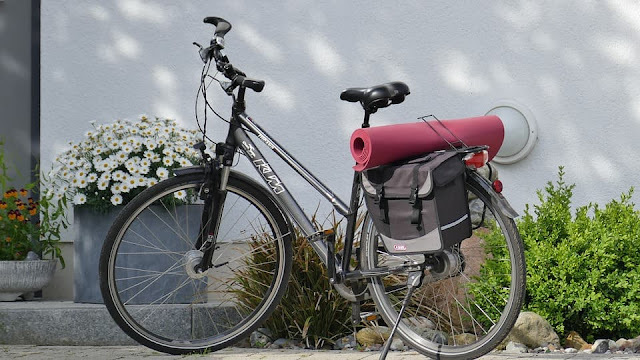 Frugal Fitness: Yoga And Road Biking: The Yin And Yang Of The Exercise World? Yoga And Road Biking: The Yin And Yang Of The Exercise World? The Chinese concept of Yin and Yang describes two elements, different in nature but at the same time still complementary to one another. To me, this is a perfect way of explaining how yoga can fit in with other exercise practices that you enjoy. In fact, yoga can be very complimentary to a range of other exercises, particularly the sport of road biking. Find out why below. Yoga can really help your road biking because it is a practice that encourages flexibility and can work against the muscle tightness only too common in the sport. In particular, any hip opening asanas like Lunges and Pigeon Pose are a good choice to include in your yoga routine, as this is often where cyclists hold much of their tension and stress. Positions like Triangle Pose and Upward Dog that focus on stretching out and releasing tension in the chest and shoulders are also useful, especially for road bikers as the hunched position necessarily for speed can cause compaction and other issues. Now, you may wonder how a fast and adrenaline pumping sport like road biking help my yoga practice? Well, for one it provides you with an excellent counterpoint to your experience on the mat. Something that can be very useful when you are learning to tune into your body and emotional states. Secondly, any exercise that involved your body working hard is opening your lungs, building muscle and generating positive hormonal reactions within the body. All things that yoga is also concerned with, making it a great activity to do in parallel to your practice. Remember too that to be successful in yoga and road biking, it's not just about going all out, but also ensuring that you have the correct equipment and mindset for each one. For biking, you will need the right machine, like the ones on display at best road bikes under 500, as well as safety gear such as helmet and knee and elbow pads. After all, it will be pretty hard to get into Child's Pose with a scraped knees! Your mindset will likely be competitive, but also draw on the lessons you have learned on the mat here, and listen to what your body is telling you. This will allow you to make more effective decisions on when to push hard and when to hold back in your riding. For your yoga practice a mat, a strap, and some blocks should be enough to get you started. Although there are many additional items that you can use to enhance your practice as you get more advanced, including essential oil diffusers and meditation cushions. In terms of mindset, be careful here not to let your competitive spirit take over your yoga. After all, it's not a competition to see who is the most bendy but a spiritually deep practice for centering the mind and body and opening the heart. Of course, like anything else in our journey in this life, the real trick is to keep them in balance like the Yin and the Yang. Where they work for the good of each other, and for the good of your body and mind as a whole. That means making time to commit to each practice and readjusting one, other, or both to achieve a complementary balance when you can see the have become unaligned. I hope you enjoyed this article about how yoga and road biking can be a potent combination for health and fitness success.